Since September 2015, a multispecialty team of district and care home nurses, community matrons, GPs and social workers in Sunderland have pooled resources to provide outpatient care. How successful has this been? A series of initiatives to reduce hospital admissions and keep patients well and cared for where they live has met with positive support in North East of England since it was rolled out in 2015. All Together Better (ATB) Sunderland is one of 14 multispecialty community provider (MCP) vanguards moving specialist care out of hospital. MCP vanguards were introduced as part of the Five Year Forward View blueprint for the NHS. The ATB programme brings together health and social care professionals with local support organisations. The vanguard covers a population of almost 300,000 people and 51 general practices. There are three main components to ATB: Recovery at Home, community integrated teams and enhanced primary care. Recovery at Home is a rapid response service available 24 hours a day, seven days a week. The multidisciplinary team provides short-term, urgent care at home during times of illness or an unexpected change in a patient’s condition that could develop into a crisis. The service has two community beds for patients who require extra support. ‘Recovery at Home is resulting in one of the lowest delayed transfers of care rates in the country,’ says ATB service delivery manager, Jon Quine. District nurses, community matrons, care home matrons, GPs, social workers and voluntary sector staff are co-located together via five community integrated teams (CITs). Each team is based in one of the five community hub locations - north, east and west of Sunderland, Coalfields and Washington. Third sector support is provided by Age UK Sunderland’s Living Well link workers and Sunderland Carers’ Centre’s support workers. 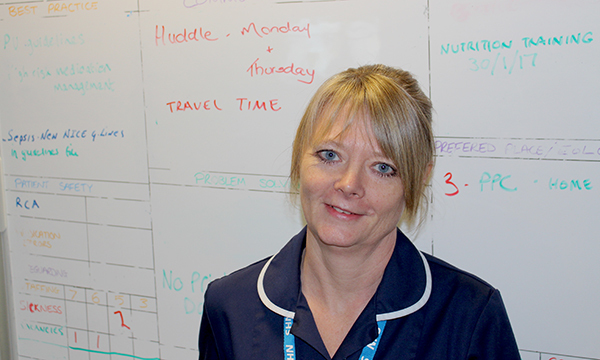 ‘Being a part of the community integrated team and being situated together has enhanced what we do as district nurses,’ says Washington CIT district nurse Judith Carson. The enhanced primary care component aims to deliver as much care as possible in the community, including bringing traditional outpatient services into the vanguard’s community hub localities. ‘By having the five hubs – where a GP takes the lead in each one - patients are able to access services such as insulin initiation via a GP in their locality,’ says Mr Quine. This means using technology to help patients feel more confident at home. Examples include having electronic prescriptions sent directly to the patients’ pharmacist and adding keypad entry to patients’ homes to enable carers and district nurses to gain access. Patients can have an alarm fitted in their home to alert the practice and they can access a priority telephone line. Weekly meetings are held at GP practices in each locality, involving a range of specialist staff (for example, mental health professionals and pharmacists) and CIT members, to discuss the best course of action for patients identified as being the most vulnerable. ‘The joint teams work proactively on health and social care planning and risk stratification of the top 3% most frail and vulnerable,’ says Mr Quine. Care home nurses have been introduced to provide an extra layer of support for care home staff, and enhance their skills and confidence in sign and symptom recognition as well as next steps. The nurses provide guidance on improving the daily routine, programme of care for residents, end of life planning and assist with signposting to support agencies. Being co-located has enabled the district nurses to understand the care home criteria for patients and what social care is available. Having voluntary organisations as part of the team benefits district nurses and patients. ‘We can chat with Age UK and the Carers Centre and uncover local services that we did not know were available,’ says Ms Carson. ‘We can also discuss the suitability of certain services for patients and ask for help with additional community support. Joint health and social care visits can be quickly set up in crisis situations. However, being situated together as one big team does bring environmental challenges around access to computers and lack of private space, Ms Carson explains. ATB has seen early signs of a 15% reduction in emergency admissions. There has been an increase in the number of referrals to Recovery at Home, a reduction in the use of the two community beds, a fall in admissions to residential care and fewer delayed transfers of care. ‘Since working as part of ATB, I have seen a lot of changes,’ says north Sunderland CIT district nurse Sue Hughes. ‘Referrals from a GP for district nursing are much quicker so care is more rapid. We are sharing much more relevant information so there is less duplication of effort for patients and staff. ‘We can plan more effectively and get the right care to people when they need it, keeping them as well as possible and out of hospital. We approach cases with a better level of knowledge about a patient’s history, circumstances and needs. We triage rapidly, arrange care and have collective understanding and ownership. ‘I am a great advocate for this way of working,’ says Hazel Taylor, advanced nurse practitioner and practice lead on unplanned admissions at Dr Stephenson & Partners in Washington. ‘The weekly meetings are a real benefit in a big practice like this. There is an earlier identification of those at risk of becoming more unwell now. ‘Engagement is better between primary care, social care and voluntary services. There is an improved understanding of all organisations involved and there is more support for one another. ‘We pre-plan care together via a person-centred health and social care plan for each at risk patient and we regularly review care plans to ensure everything has been put in place to prevent unplanned admissions. ‘This identifies if patients require an emergency care plan. We encourage self-help and can put together plans alongside patients and carers so they know how to manage their health better. This is something we would never have done in the past. Could a master’s-level district nursing apprenticeship help solve workforce woes?